The two resorts, and the closure orders issued against them today. The Bureau of Internal Revenue has shut down two resorts on Bohol province’s Panglao Island for under-declaring their income. 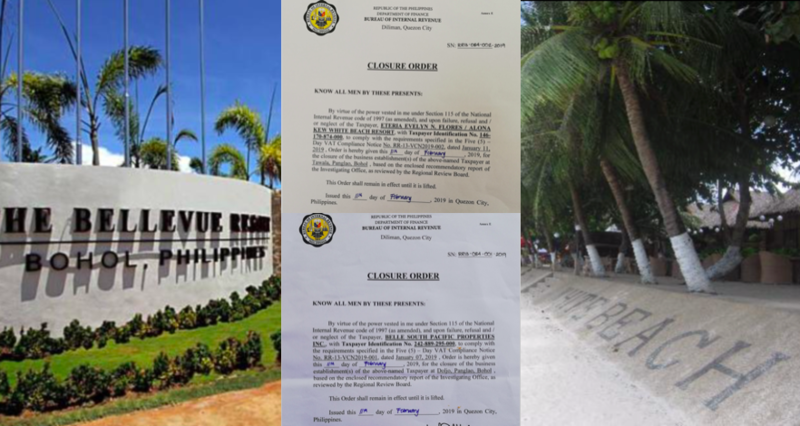 A team from the BIR went to Alona Kew White Beach Resort on Alona Beach and Bellevue Resort, both in Panglao town, today (Tuesday, February 12) to close them down. “We are implementing the closure for non-payment of taxes,” said Eduard Pagulayan, provincial BIR director. He said they discovered that the resorts were not declaring their total income to the agency. The amount owed to the government by the two resorts has not been revealed, although Pagulayan described it as “substantial”. He added that the resorts had previously been given sufficient time to explain the alleged violations. The owner of Alona Kew White Beach Resort, Eteria Evelyn Flores, also owns two other businesses — the Eteria Restaurant and EE Rent a Car. These have also been closed. In a statement, said the resort’s management admitted to “some lapses” with their tax compliance. “This is attributed to the resort’s failure to engage a tax professional to properly guide them in complying with the tax laws and regulations. Alona Kew White Beach Resort has paid a substantial amount of its deficiency taxes,” the statement said. Bellevue, operated by Belle South Pacific Properties, is an exclusive five-star resort with more than 150 rooms. Resort manager Rommel Gonzales said they had already complied on the same day. “We paid already so it’s done,” he said. However, Pagulayan said he was still waiting to confirm that the payments had been sent. Last November, the BIR closed down Bohol Henann Resort, for violating the tax code, including under-declaration of sales. However, the Resort resumed operations immediately after the management paid the outstanding taxes in two hours. We have also reported that live electrical wires were found running under Alona Beach. These have since been removed. That’s right, close them down for not paying their share. I mean it’s a pity for our “lawmakers”, as they won’t have enough Pork.